OSHA (Occupational Safety and Health Administration) has announced a new work place safety rule for respirable crystalline silica dust exposure. It is called the §1926.1153 Respirable crystalline silica rule and is in effect as of June 23, 2017. The new rule further limits the PEL or Permissible Exposure Limit set by OSHA for worker exposure to silica dust. (PEL is OSHA's metric for measuring how much dust debris a worker can breath in over an eight hour period). Workers who inhale very small crystalline silica particles are at increased risk of developing serious silica-related diseases. These tiny particles (known as "respirable" particles) can penetrate deep into workers' lungs and cause silicosis, an incurable and sometimes fatal lung disease. Crystalline silica exposure also puts workers at risk for developing lung cancer, other potentially debilitating respiratory diseases such as chronic obstructive pulmonary disease (COPD), and kidney disease. When OSHA was formed in 1971, the existing standard of 100 μg/m3 (100 micrograms per cubic meter) was set. OSHA now feels that standard is too loose and is outdated given more worker exposure in construction to silica in cement fiber board, stone counter top and synthetic stone countertop fabrication for kitchen and bathroom vanities. As a result it pushed to enact a new more stringent rule. The new rule effectively cuts the allowable exposure to silica dust in half. The current law allowing a PEL of 100 μg/m3 over an 8-hour work period is being reduced to 50 μg/m3. Fortunately, compliance is a lot simpler than with other government regulations affecting construction such as the EPA Lead Paint Renovation, Repair and Painting (RRP) Rule. The new rule provides options to manage indoor and outdoor exposures to silica but requires the following of all contractors/employers according to OSHA. Develop a written exposure control plan, offer medical exams to highly exposed workers and train workers on silica risks and how to limit exposures. 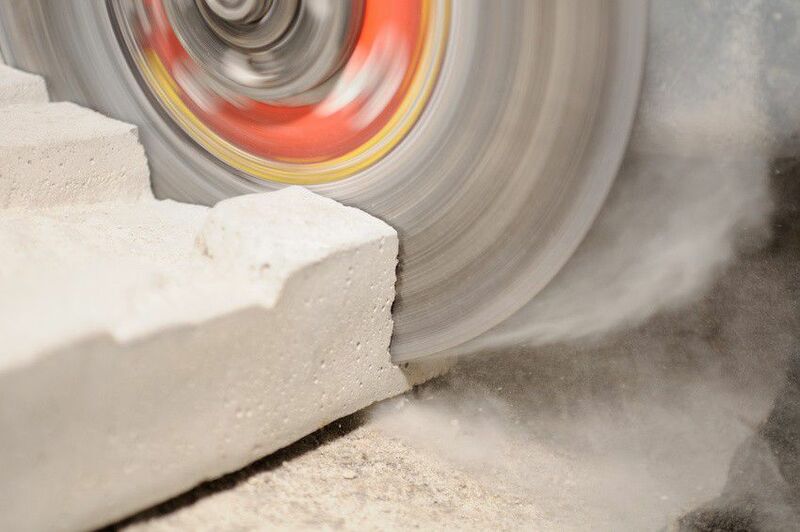 OSHA's rule attempts to lower silica exposure by using dust control methods that are already in fairly common use. For example, wetting down work operations like using a tile cutting wet-saw to keep respirable crystalline silica dust from getting airborne, enclosing a work operation ("process isolation"), or by using a source vacuum system to collect the silica dust at the point of creation before it can be inhaled. One way to protect the worker from airborne contaminants is to use a respirator. A respirator has an APF rating that documents the minimum level of filtration protection it provides the user when properly fitted and used. Use saw equipped with integrated water delivery system that continuously feeds water to the blade. Operate and maintain tool in accordance with manufacturer’s instructions to minimize dust emissions. Use saw equipped with commercially available dust collection system. Operate and maintain tool in accordance with manufacturer's instructions to minimize dust emissions. Dust collector must provide the airflow recommended by the tool manufacturer, or greater, and have a filter with 99% or greater efficiency. Use drill equipped with commercially available shroud or cowling with dust collection system. Dust collector must provide the airflow recommended by the tool manufacturer, or greater, and have a filter with 99% or greater efficiency and a filter-cleaning mechanism. The OSHA silica dust rule requires an APF rating of 10 for construction in some applications. This protection level guards against moderate to fine particles of dust, oil or water mists from cutting plaster, cement or cement fiber or from sanding wood. A respirator rated at APF 10 is not a big deal and can be accomplished by use of a special half mask dust filter (having a BLUE elastic strap). Such filters are made by 3M such as the 8810 (unvalved) or the 8822 (valved) face mask.